I suspect that there has never been born a man who truly wanted to be evil. I also suspect that the man has not yet lived who did not desire to be good. We all want to be good, and, dare I say, we all desire to be great. The difficulty, however, is that that desire does not come hand in hand with a field manual. And so how do the multitudes of men seek out greatness? Often they seem to look at examples of great men, many of whom have wielded enormous power, have possessed much wealth, and have been esteemed by many. And so, one might try to be great by seeking these things out. But suppose that great men were not made great by the things they had? Suppose that greatness is something else entirely, and those who seek it in things, seek in vain? That story that is so powerful is Lord of the Rings. 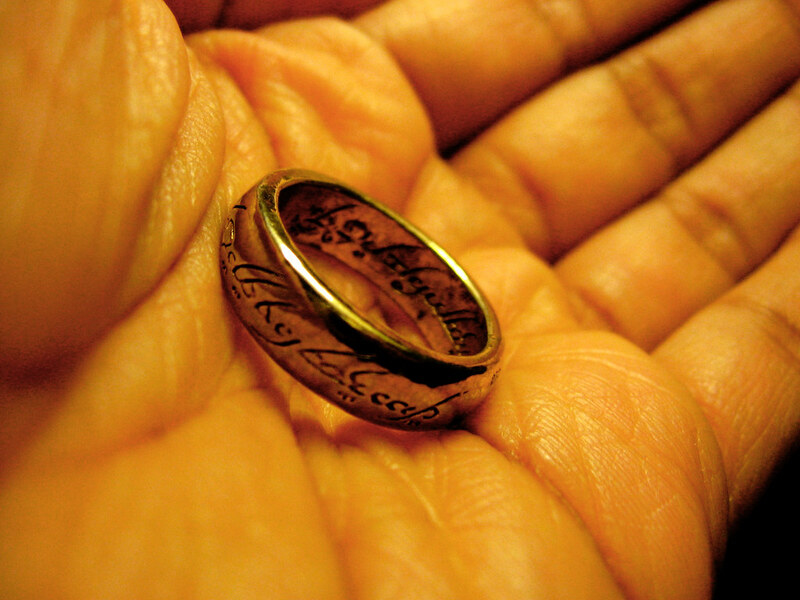 For those unfamiliar with the plot, there is a ring which contains the power and essence of the evil lord, Sauron, who can never be destroyed while the ring remains intact, and so long as he exists he threatens all the free peoples of Middle Earth. But in order to destroy the ring, it must be cast into the fires of Mount Doom, but all the armies of Sauron lie between it and those who bear the ring. The ring has but to placed on one’s finger, and the power of the evil one will be at the disposal of the wearer. But, this power is tainted. It is so great that none could wield it without being consumed by it, and becoming themselves an evil lord. The taint of the ring is so great, that even he who has it in his keeping will be tempted and tormented by it, constantly desiring to put it on. The only creature who has ever succeeded in keeping the ring without falling prey to its allure is the hobbit Bilbo Baggins. There is a critical point in the plot at which a council of great men, elves, dwarves, and wizards come together to decide how to rid the world Sauron and what to do with the ring. In the end, knowing that none could wield the ring without succumbing to its evil, the decision is made to send it to the mountain, despite the hosts of evil lying between. But the most curious part of the decision is this: it is sent in the hands of the weakest among them, the hobbit Frodo Baggins. This decision is made because it is only the race of hobbits that has ever demonstrated the ability to possess the ring without being seduced by it. Evil and greatness are opposites, and so that which is most effective at resisting evil, is the truest greatness. And what Gandalf is saying, is that hobbits possess a greatness which is deeper and greater than even his own wisdom, the power of the elves, or the valor of men. And this is why the greatest of evils must be borne by a simple hobbit, in spite of his apparent weaknesses and ignorance. Although they are at many points aided by providence and by great men. in the end it is the two hobbits who are able to bear the ring to Mount Doom and destroy the evil lord. They endure the constant burden and temptation of the ring, as well as a number of evil and desperate situations. What guides them through it all? A simple, and profound love for life itself. The modern mind may be inclined to think that the simpler a thing is, the lesser it is. What the story Lord of the Rings, and the race of hobbits shows us, is precisely the opposite. Greatness is not contained in immense power, capacious wisdom, or vast riches. Rather, it is in the simplicity of one’s love. It is in the love of life, friends, family, laughter, making merry, and the simplest thing of all: the Creator, that greatness consists.